For SALE: Applause (Ovation) Semi Acoustic, Pignose amp, Rocky Roads pedal. Applause semi acoustic. Its about 5 years old, have played it lots & with great pleasure. It is 5 years old so it does have a few scratches. Selling it with an external soundhole pick-up: The built in one has controls, it isnt bad but the soundhole pick-up gives it a lot more warmth which I thought it lacked with the built in pick-up. Im sure I use it on one of my myspaces somewhere. I suppose with the pick-up added I want 100 for it. Pignose amp. The legendary. I absolutely love the sound and would love to keep it. Will probably buy a new one as soon as I get to the USA. Have only used it as a practise amp but will eventually use one live I think. As used by so many people. Offers? Theyre going for 50 on ebay. Rocky Roads spinning speaker simulator. Its a nice wee pedal for the price. Its been modded to take away some of the gain as it was absurd before. It sort of simulates a rotating speaker / leslie cabinet. Works ace, particularly together with a tremolo. Have used it on my guitars, actually used it to make my lap steel sound like an organ. Which works. Works great with keyboards too. I've not used it as much due to change in bands, sounds, etc. Ill post some links & pictures when Im at home tonight. Can the pignose work off of batteries?? If so I'll offer 40 squid. 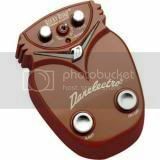 I should have mentioned about the Danelectro Rocky Roads that most audio examples on the web will only give you a chorus type sound. Which is nice but there's lots more to this pedal. how much for the guitar without the pick up? Ah good! Yes, Billy Idolwild was first. Anyone interested in the danelectro? Maybe.............cut me your best Bouma deal!